Air Canada is maintaining a reasonably positive outlook on demand in early 2015 across all geographies, with the exception of certain pockets of pressure including some areas in Western Canada where the energy sector is a significant economic driver. The airline’s results in 2014 reflect its business adaption during the last couple of years of increasing its leisure passenger mix and long-haul flying, which pressure yields. But Air Canada stresses the incremental capacity driven by the longer stage lengths and change in passenger composition is low-cost incremental capacity that improves margins and profitability. Air Canada largely proved the validity of that theory in CY2014 as operating margins and adjusted profits increased for the year. The airline is facing some cost pressure in CY2015 due the falling value of Canada’s currency against the USD, but believes its foreign denominated revenues create some hedge against some of its expenses paid in USD. Air Canada’s yields fell 1.3% in CY2014 as passenger unit revenues notched down 0.6%. The decline in passenger unit revenue was not as pronounced as the drop in yields due in part to a 0.6ppt increase in load factor to 83.4%. The airline estimates that its average stage length grew by 2.3% year-on-year, and calculated that on a stage length adjusted basis that its yields were essentially flat year-on-year. Reiterating previous messages to the investment community that put the drop in yield in perspective, Air Canada CFO Michael Rousseau recently told analysts that “modest yield declines are an anticipated and natural consequence of the successful implementation of Air Canada’s business strategy to increase long-haul international and leisure flying”. Mr Rousseau stated that the incremental capacity generated by the longer length of haul and high mix of leisure travellers is being introduced with lower unit costs, preserving margins and profitability. Air Canada’s unit costs excluding fuel and expense related to vacation ground packages fell faster than yields in CY2014, dropping 2.6%, which helped to push margins up 1.1ppt to 6.1%. Its adjusted net income for the year increased by CAD191 million (USD152.6 million) to CAD531 million (USD424.4 million). 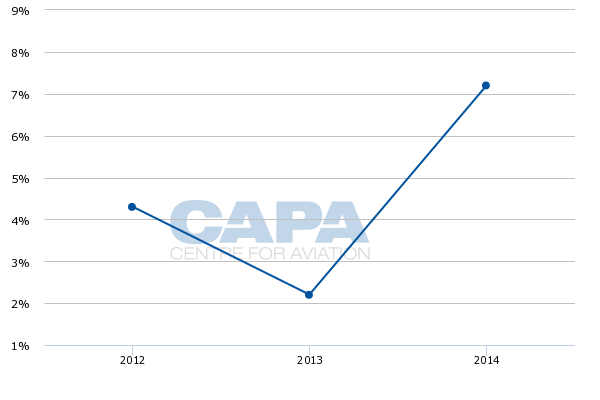 Air Canada’s system capacity increased by 7.8% in CY2014 as traffic grew 8.5%. Operating revenue increased across each region, but yields and unit revenues only increased in Pacific and 'other' regions. Unit revenues were basically flat in the US transborder markets. Air Canada’s Pacific yields increased 1.3% in CY2014, driving a 1.7% rise in passenger unit revenues. Its yield performance reflects yield growth on most Pacific routes, said Air Canada, with the exception of Hong Kong. The airline is operating a higher density 777 between Vancouver and Hong Kong, which results in larger composition of lower yielding leisure customers. The airline also benefitted from a favourable currency impact of CAD36 million (USD28.8 million). Yields in other regions, that include Air Canada’s service to Latin America, increased 2.1% year-on-year, driven specifically by yield growth on routes to Mexico and sun destinations. The airline also benefitted from a favourable CAD14 million (USD11.2 million) currency impact in those markets. The 2.8% yield decline in Air Canada’s US transborder network reflects a 3.4% rise in average stage length as long-haul capacity grew and short-haul service was slightly reduced year-on-year. The increase in stage length contributed to 1.9ppt of the yield decline, Air Canada stated. During 2014 the airline also had a higher level of lower yielding incremental international-to-international passenger flows in its transborder markets. Air Canada recorded a 2.3% drop in domestic yields year-on-year in CY2014, “which reflected increased capacity and significant competitive pricing activities on routes within Ontario and Quebec and on routes within Western Canada”, the company stated. The company also explained that the higher proportion of lower yielding US transborder and international passenger flows connecting onto domestic flights also contributed to the decline in yields. Yields on Air Canada’s Atlantic routes did not drop as sharply as other regions. The 0.6% decrease was again driven by longer stage length, a higher proportion of leisure seats and increased operations by Air Canada’s low-cost airline rouge. Some yield decreases were offset by a favourable performance in Air Canada’s business cabin, and an increase in premium economy traffic. Air Canada feels fairly comfortable with the overall demand environment at the beginning of 2015, but does expect some regions where energy is a big economic driver to come under pressure. “We have redeployed and will continue to redeploy capacity to reflect the forecasted changes in the demand environment, on certain services such as Alberta, Saskatchewan and selective regional markets in British Colombia,” the airline stated. 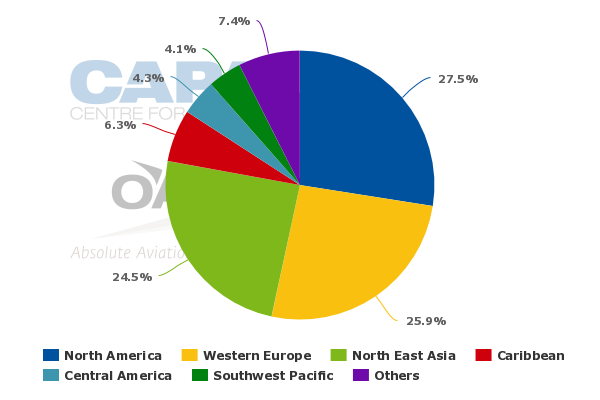 WestJet has the largest presence measured by ASMs at some of the largest airports in those regions, according to CAPA and OAG data for the week of 9-Feb-2015 to 15-Feb-2015, holding a 42% share in Edmonton, a 43% share in Calgary, and a 33% share in both Saskatoon and Regina. Recently, WestJet CEO Gregg Saretsky noted that those markets need to be watched closely, but “we’re not particularly concerned with what we’re seeing today, but that could change very quickly and we’re listening to all the capital plans that are moving around with our oil patch partners and how that might impact future demand”. He added that most of the projects underway in the provinces more reliant on the energy industry are continuing “and what is happening is the shutting down of projects that haven’t yet started… I wouldn’t say we’re any more exposed than any other operator and we do have a national footprint and a large Southern footprint as well”. At the beginning of 2015 WestJet expressed more concern about increased industry capacity on routes to Mexico and the Caribbean as some of its competitors have added supply in those markets. The airline cited some pricing and margin pressure in those regions, but Air Canada when queried about its outlook stated it was seeing healthy demand in its winter markets. 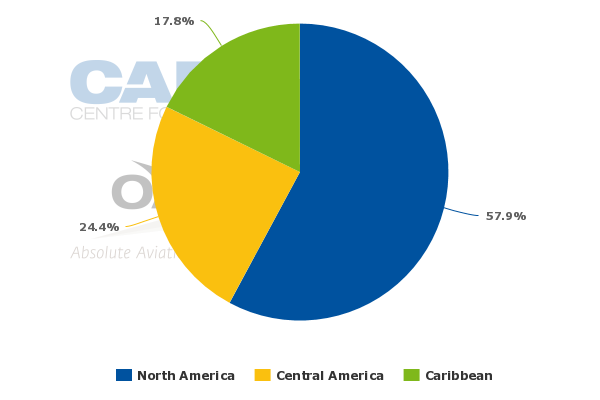 Air Canada did not mention any specific details about routes to the Caribbean, but WestJet has a larger percentage of its international ASMs – 57.9% deployed into the Caribbean for the week of 9-Feb-2015 to 15-Feb-2015. The Caribbean represents just 6.3% of Air Canada’s international ASMs, although at the beginning of Feb-2015 its seats on offer to the region had grown 15% year-on-year. 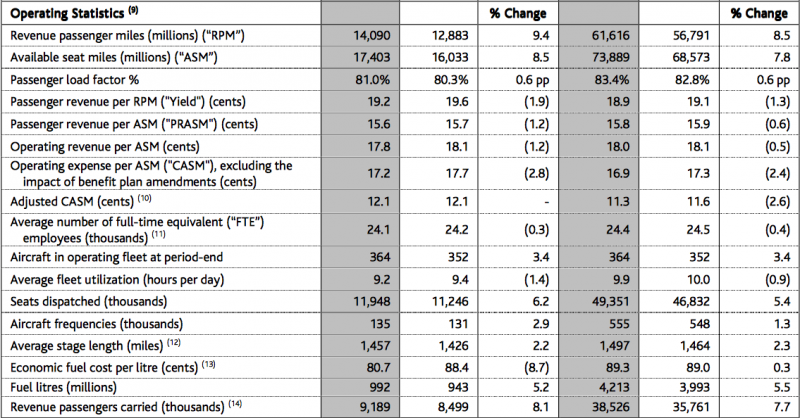 After recording a solid decrease in its CY2014 adjusted unit costs and a 2.6% drop in 4Q2014, Air Canada is now projecting a rise in 1Q2015 unit costs of 0.5% to 1.55. 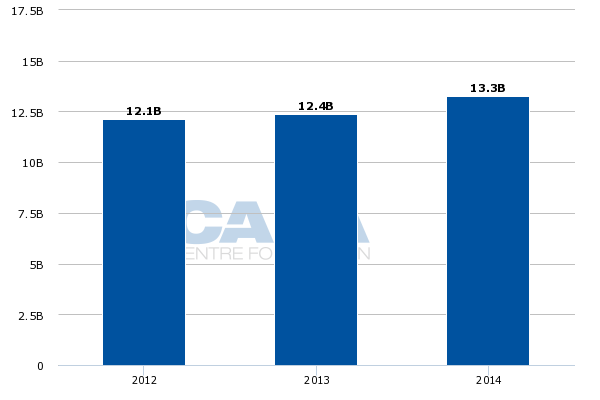 The airline stated that if the CAD exchange rate was at 2014 levels, its 1Q2015 unit costs would drop 2% to 3%. For CY2015 Air Canada is projecting a unit costs decrease of 0.75% to 1.75%, and estimates a 3.75% to 4.75% drop if the CAD was trending at 2014 levels. Air Canada’s projections are based on the CAD trading at 1.25 against the USD. Air Canada states that even as its unit costs are negatively affected by the weaker CAD, foreign denominated revenues provide a natural hedge against the non fuel expense denominated in the USD. In CY2014, Air Canada estimates that its average direct USD denominated revenues were USD1.5 billion (USD1.2 billion), and coupled with an extra USD1 billion (USD799.2 million) in non-US revenues that are translated back to the USD, the total foreign currency denominated revenue was roughly USD2.5 billion. 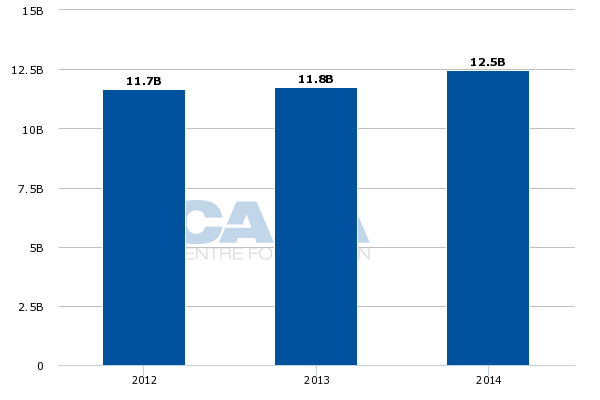 Air Canada’s overall operating revenue grew CAD890 million (USD711.3 million) in CY2014 to CAD13.3 billion (USD10.6 billion), which was growth of 7.2% year-on-year compared with 2.2% in CY2013 and 4.3% in CY2012. 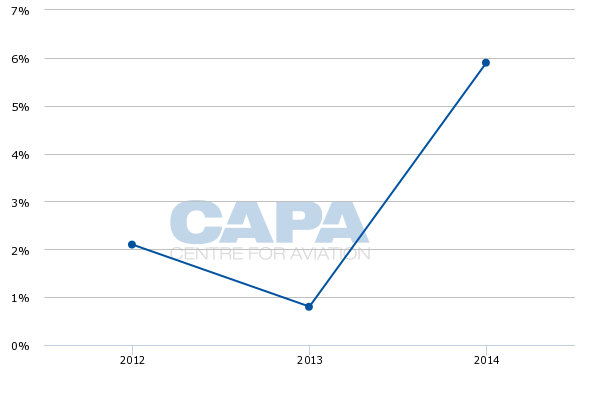 The airline’s operating expenses jumped 5.9% in CY2014 to CAD12.5 billion (USD10 billion). USD denominated expenses increased CAD397 million (USD317.3 million), offset in part by lower jet fuel expense of CAD200 million (USD159.8 million). Air Canada’s nearly 6% jump in CY2014’s operating expense compares with 2% increase in CY2012 and 0.8% growth in CY2013. One of the largest increases for Air Canada was aircraft maintenance, which grew by CAD96 million (USD76.7 million) or 15% year-on-year. The rise was driven in part by CAD43 million (USD34.5 million) in unfavourable currency impacts, and higher volumes of engine and airframe maintenance. Air Canada continued to deliver solid cost reductions and improving financial results for CY2014 as part of a business transformation often referenced by executive management to show that the airline has largely shed its outdated legacy thinking. With most of the pieces of the transformation in place, 2015 should generally be another strong year for Air Canada. The most apparent threat at the moment seems to be cost headwinds stemming from the weaker CAD against the USD, which in real terms may slow its unit cost declines while yields may continue to decrease at their current levels. With a relatively diversified network and an overall falling cost structure, Air Canada should be able to withstand the challenges, and for now is keeping its projected capacity growth of 9% to 10%.